This morning in Huntington at 7:20AM it’s currently a balmy 68 degrees under overcast skies. Winds are out of the southwest at 2-5 mph. Relative humidity is 76%, dewpoint 61, barometric pressure 30.06”. Yesterday’s high was 79, and the overnight low was 56. A slow moving cold front will produce occasional showers and thunderstorms this afternoon across the region. Some thunderstorms may produce localized heavy downpours, frequent lightning, and gusty winds. A widespread rainfall is expected tonight into Sunday, with additional showers on Monday along with cooler temperatures. We’ll see partly sunny skies with a chance of showers this morning, then mostly cloudy skies with a 50% chance of showers and thunderstorms this afternoon. Some thunderstorms may produce gusty winds and heavy rainfall this afternoon. Highs will be in the lower 80s with south winds 15 to 20 mph gusting up to 35 mph. Tonight should bring occasional showers and thunderstorms until midnight, then showers with a slight chance of thunderstorms after midnight. Lows will be in the lower 50s with southwest winds 10 to 15 mph gusting up to 30 mph, then becoming westerly after midnight. Chance of rain is 90%. Sunday should be cloudy with occasional showers with a slight chance of thunderstorms in the morning, then a chance of showers in the afternoon. It’ll be less humid and cool with highs in the upper 50s and north winds around 10 mph. Chance of rain is 80%. Sunday night showers are likely. Lows will be in the upper 40s with east winds around 10 mph. Chance of rain is 70%. Monday showers are likely. Highs will be in the upper 50s with east winds around 10 mph. Chance of rain is 70%. Showers will persist into Monday night. Lows will be in the upper 40s. Chance of rain is 60%. Last year on this date we had a high of 67 and a low of 47. We picked up 0.15″ of rain. Tomorrow will be 1m27s longer. The Moon is waxing gibbous, 12d 7h old with 90% illumination. I’m always captivated by the way conifers grow. 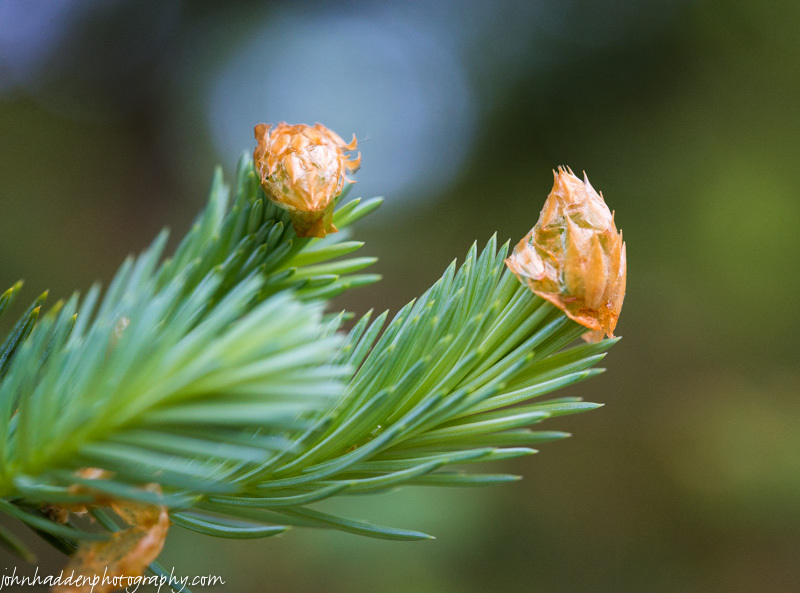 From tight little buds, the bristles of new growth emerge and stretch while the dried husks drop to the ground. Nikon D600, Sigma 105mm macro, ISO 1250, f/6.3, 1/500″ exposure. This morning in Huntington at 6:50AM it’s currently 55 degrees and foggy under overcast skies. Winds are calm. Relative humidity is 99%, dewpoint 54, barometric pressure 30.32” and rising. We picked up 0.41” of rain in the past 24hrs. Yesterday’s high was 75, and the overnight low was 53. A ridge of high pressure will be over the region today and tonight. Then a strong cold front will move slowly southeast from Canada on Saturday and move through the region Saturday night brining more showers and thunderstorms. This morning’s fog should burn off soon revealing sunny skies. It’ll be warmer with highs in the mid 80s and light and variable winds, becoming southerly around 10 mph this afternoon. Tonight should be mostly clear until midnight, then become partly cloudy. Lows will be in the mid 60s with south winds 10 to 15 mph. Saturday should start out mostly cloudy with a slight chance of showers in the morning, then become cloudy with showers and thunderstorms likely in the afternoon as the cold front moves in. Highs will be in the lower 80s with south winds 15 to 20 mph. Chance of rain is 60%. Saturday night should bring occasional showers and thunderstorms. Lows will be in the lower 50s with west winds 15 to 20 mph gusting up to 30 mph. Chance of rain is 80%. Sunday’s looking partly sunny with a 50% chance of showers as high pressure being stop build back in. It’ll be noticeably cooler with highs in the lower 60s and north winds 15 to 20 mph. Sunday night should be partly cloudy with lows in the mid 40s. Last year on this date we had a high of 70 and a low of 37. We picked up 0.01″ of rain. Tomorrow will be 1m31s longer. The Moon is waxing gibbous, 11d 6h old with 83% illumination. 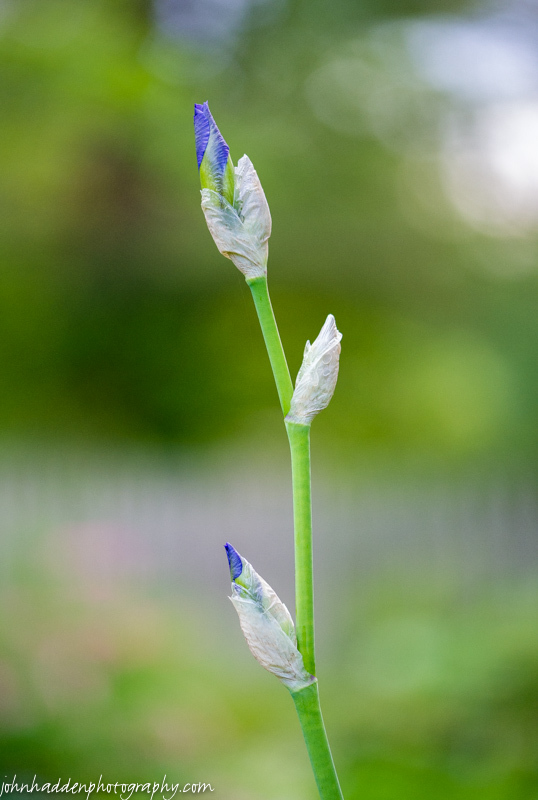 The Siberian iris in our ornamental garden are about to burst! Nikon D600, Sigma 105mm macro lens, ISO 800, f/8, 1/320″ exposure. We’re back! We spent the last week in Ohio celebrating our daughter’s graduation from Oberlin College. It was a wonderful time! This morning in Huntington at 6:30AM it’s currently 63 degrees under mostly cloudy skies. Winds are calm. Relative humidity is 97%, dewpoint 62, barometric pressure 30.01” and rising slowly. We picked up 0.08” of rain in the past 24hrs. Yesterday’s high was 86, and the overnight low was 62. Another cold front will move through the region today bringing a chance of showers and a chance for some thunderstorms this afternoon across Vermont. A ridge of high pressure will build into the region tonight and will remain over us through Friday. We’ll see cloudy skies with a chance of showers this morning, then a chance of showers and thunderstorms this afternoon. It will be a little cooler with highs in the upper 70s and southwest winds 10 to 15 mph, becoming westerly 15 to 20 mph this afternoon. Chance of rain is 50%. Tonight should be partly cloudy until midnight, then clear. Lows will be around 50 with northwest winds 10 to 15 mph until midnight, becoming light and variable. Friday should be sunny with highs in the lower 80s and light and variable winds, becoming southerly around 10 mph in the afternoon. Friday night should be mostly clear with lows in the mid 60s and south winds 10 to 15 mph. Another cold front will swing through on Saturday bringing showers and thunderstorms. Highs will be in the upper 70s with south winds 15 to 20 mph gusting up to 30 mph. Chance of rain is 70%. Saturday night should bring occasional showers and thunderstorms. Lows will be in the upper 40s. Chance of rain is 80%. Last year on this date we had a high of 58 and a low of 44. We picked up 0.19″ of rain. Burlington norms for this date are highs of 71 and lows of 49. Tomorrow will be 1m34s longer. The Moon is waxing gibbous, 10d 6h old with 75% illumination. 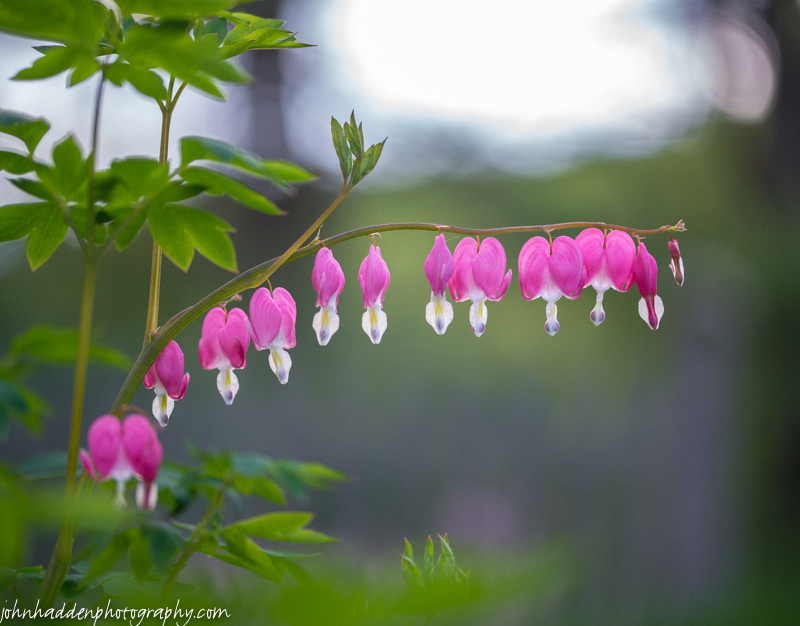 Bleeding hearts blooming in our ornamental garden. You go away for a week and all kinds of things are happening when you return! Nikon D600, Sigma 105mm macro lens, ISO 800, f/3.2, 1/1000″ exposure. This morning in Huntington at 7:50AM it’s currently 47 degrees under overcast skies. Winds are out of the west at 3-6 mph. Relative humidity is 76%, dewpoint 39, barometric pressure 29.79” and rising. We picked up just a 0.01” trace of rain in the past 24hrs. Yesterday’s high was 78, and the overnight low was 47. The cold front that moved through later yesterday bringing showers and some thunderstorms has ushered in cool high pressure. We’ll see cloudy skies with a slight chance of sprinkles this morning, then partly sunny skies this afternoon. Highs will only be in the mid 50s with northwest winds 10 to 15 mph gusting up to 25 mph. Tonight should be mostly clear with lows in the mid 30s and west winds 10 to 15 mph gusting up to 25 mph, then becoming southwesterly after midnight. Thursday should be partly sunny with highs in the mid 60s and southwest winds around 10 mph. Thursday night should be partly cloudy with lows in the lower 40s and southwest winds around 10 mph. Friday should start off partly sunny with a 30% chance of showers as an upper level trough and associated cold front approach. Highs will be in the upper 50s with northwest winds 10 to 15 mph gusting up to 25 mph. Friday night should be mostly clear with a 30% chance of rain showers. Lows will be in the mid 30s. Last year on this date we had a high of 69 and a low of 36. Burlington norms for this date are highs of 69 and lows of 47. The record low was 30°F in 2002 (we had a low of 31). Tomorrow will be 1m58s longer. 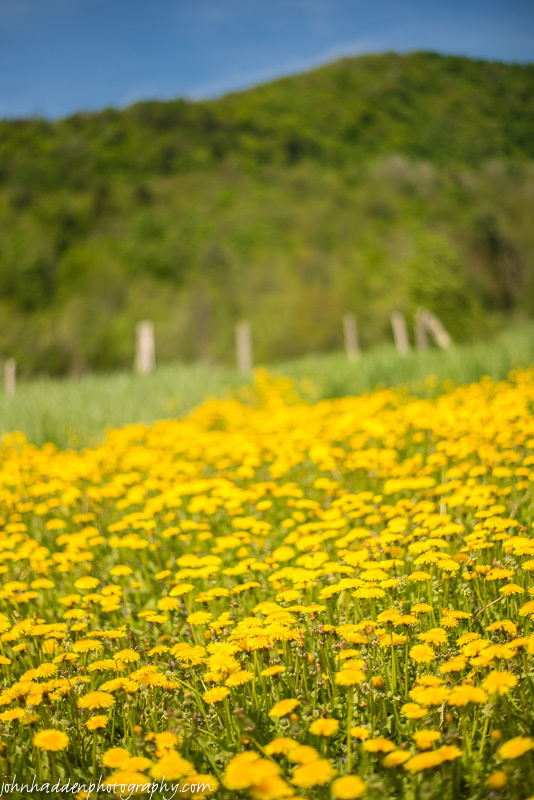 The dandelions are in full bloom these days, covering whole fields in bright yellow. This crop was along Shaker Mountain Road. This morning in Huntington at 6:35AM it’s currently 61 degrees under overcast skies. Winds are calm. Relative humidity is 95%, dewpoint 60, barometric pressure 29.84”. We picked up 0.04” of rain overnight. Yesterday’s high was 82, and the overnight low was 61. Showers will slowly exit the region to the east this morning followed by a brief break in the precipitation. A sharp cold front will move into the region from the St. Lawrence valley later this afternoon bringing thunderstorms, gusty winds, and small hail. We’ll see occasional showers this morning, then numerous thunderstorms and scattered showers this afternoon. Some thunderstorms may produce gusty winds and small hail this afternoon. Highs will be in the upper 70s with southwest winds around 10 mph. Chance of rain is 90%. Tonight should be mostly clear until midnight, then become partly cloudy. It’ll be less humid with lows in the mid 40s and west winds 10 to 15 mph. Cool high pressure will build in Wednesday bringing partly sunny skies and seasonably cool temperatures with highs only in the upper 50s with northwest winds 10 to 15 mph gusting up to 25 mph. Wednesday night should be clear with lows around 40 and west winds 10 to 15 mph gusting up to 25 mph. Thursday’s looking partly sunny with highs in the mid 60s and west winds around 10 mph. Thursday night should be partly cloudy with lows in the lower 40s. Last year on this date we had a high of 64 and a low of 35. Burlington norms for this date are highs of 68 and lows of 46. The record high was 91°F in 1989. Tomorrow will be 2m2s longer. The Moon is a waxing crescent, 1d 6h old with 1% illumination. 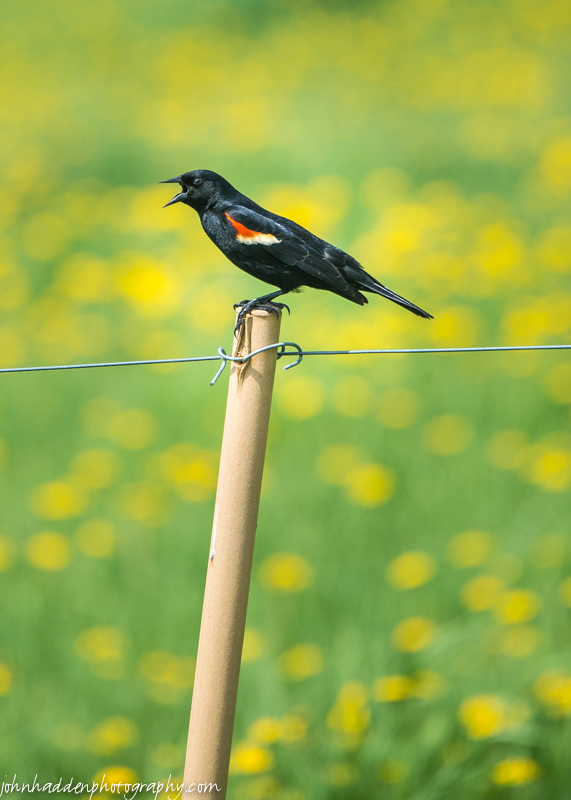 This redwing blackbird was enjoying yesterday’s sunshine along Camel’s Hump Road. The dandelions are in full bloom in the field beyond. Nikon D600, Sigma 120-400mm lens @ 400mm, ISO 320, f/8, 1/640″ exposure. This morning in Huntington at 7:30AM it’s currently 56 degrees under clear skies. Winds are calm. Relative humidity is 98%, dewpoint 55, barometric pressure 30.12” and rising slowly. Yesterday’s high was 77, and the overnight low was 49. South winds will develop across the region today ahead of a low pressure system approaching from the west. We’ll see mostly sunny skies with highs in the upper 70s and south winds 10 to 15 mph. Tonight should be cloudy with showers likely, mainly after midnight. Lows will be in the upper 50s with south winds 10 to 15 mph. Chance of rain is 70%. Tuesday showers are likely in the morning, then showers and thunderstorms likely in the afternoon as a cold front associated with the low moves through. Highs will be in the mid 70s with southwest winds 10 to 15 mph. Chance of rain is 70%. Tuesday night should be partly cloudy with a 50% chance of showers. Lows will be in the mid 40s with west winds 10 to 15 mph gusting up to 30 mph. High pressure will begin to build in Wednesday bringing partly sunny skies and seasonably cooler temperatures. Highs will be in the upper 50s with northwest winds 15 to 20 mph gusting up to 30 mph. Wednesday night should be mostly clear with lows in the lower 40s. Last year on this date we had a high of 62 and a low of 34. Tomorrow will be 2m4s longer. The Moon is new, 7 hours old with 0% illumination. 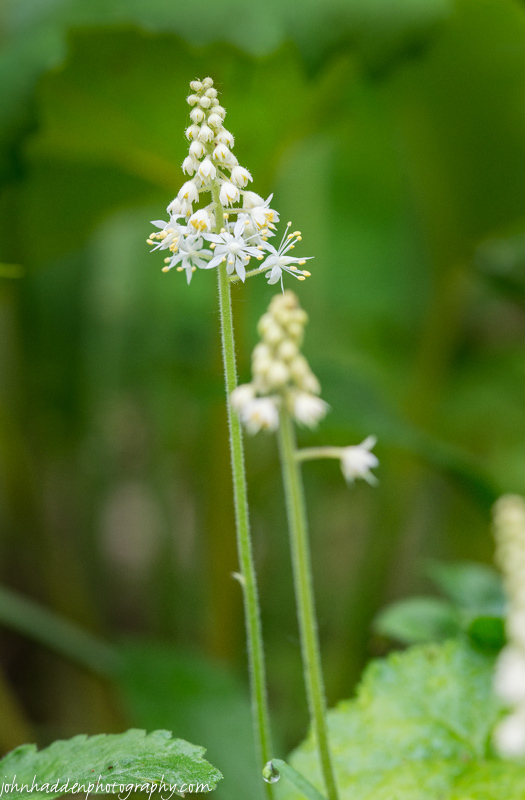 Delicate foam flower is blooming now in the woods and along Fargo Brook. Nikon D600, Sigma 105mm macro lens, ISO 800, f/7.1, 1/125″ exposure. 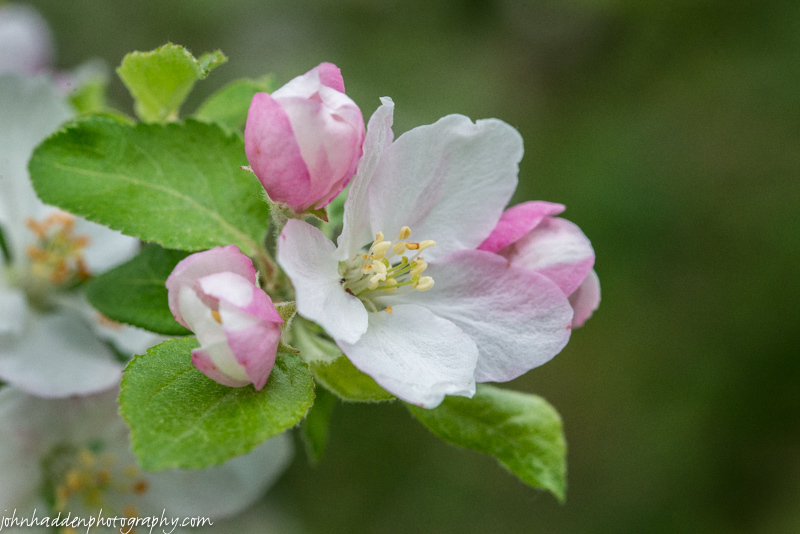 Apple blossoms abound this year. This morning in Huntington at 7:35AM it’s currently 60 degrees under mostly cloudy skies. Winds are calm. Relative humidity is 98%, dewpoint 60, barometric pressure 30.13” and rising slowly. We picked up just a 0.01” trace of rain in the past 24hrs. Yesterday’s high was 74, and the overnight low was 58. Morning clouds will give way to sunshine as high pressure builds into the region. We’ll see partly sunny skies with highs in the upper 70s and north winds around 10 mph. Tonight should be clear with lows in the lower 50s and northeast winds around 10 mph until midnight, becoming light and variable. Monday should start out mostly sunny with a slight chance of showers and thunderstorms in the afternoon as a surface low and attendant cold front approach from the Great Lakes. Highs will be in the mid 70s with south winds 10 to 15 mph gusting up to 30 mph in the afternoon. Chance of rain is 20%. Monday night showers are likely with a chance of thunderstorms. Lows will be in the upper 50s with south winds 10 to 15 mph and gusting up to 25 mph. Chance of rain is 70%. Tuesday showers and thunderstorms are likely. Highs in the mid 70s with south winds around 10 mph. Chance of rain is 60%. Tuesday night should be partly cloudy with a 50% chance of showers and thunderstorms. Lows will be in the upper 40s. Last year on this date we had a high of 68 and a low of 43. We picked up 0.80″ or rain. Tomorrow will be 2m7s longer. The Moon is a waning crescent, 28d 16h old with a wee 1% illumination. It’s a good year for apple blossoms as I’ve seen copious blooms on trees all around Huntington. A bumper crop of wild apples awaits this fall! Nikon D600, Sigma 105mm lens, ISO 800, f/13, 1/250″ exposure.